It is Wednesday, the third day of the winter semester and the third “real” day of my sabbatical. Sure, it officially started on January 1st, but those days between the 1st and the start of term on January 5th were still part of the holidays. 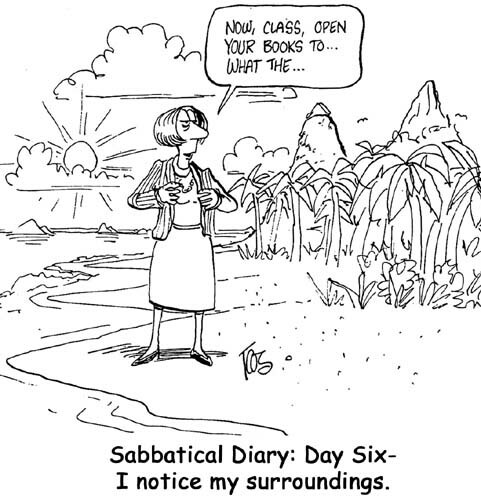 I got ready for the real sabbatical work to begin on those days — organized my desk, sharpened my pencils, etc. But now there are no more excuses. And it isn’t easy. I know that this is likely not a popular thing to say, but stay with me. First of all, I’m so very grateful for the sabbatical. I truly am. It is a gift and I want to make every moment count. But that is the rub. I want to make every moment count. What does that even mean? I began on Monday morning in a state of panic–there is not enough time left in my sabbatical (only 52 weeks!) to get it all done! I grabbed some books from my ever-growing “to read” pile and started ploughing through them, wildly taking notes and barely stopping for lunch. At the end of the day I felt worse. There are always going to be more books! I also realized that if the goal is to simply get through them, I’m not really absorbing what is written in them. What is the point of that? I fear that the past decade or so in academia has conditioned me to the idea of getting through, getting it done, checking it off the list. To what end though? There is always another hoop or deadline. Academics are skilled at multi-tasking–juggling grading, meetings, grant writing, committee work, lecture prep, report writing, form filling, etc. But when, if ever, is there time to read for the sake of engaging with new knowledge? This, it seems, should be the starting point for everything else. How have we lost sight of that? Part of this sabbatical may be about unlearning some old habits. Quinn Norton has written a great essay called “Against Productivity” that reminded me that the fast-paced, multi-tasking way of being in the world is not the only way. I’ve filed this essay away in my Evernote. It is one I think I will want to return to throughout this year. Yesterday I tried a different approach. I opened up the book manuscript that I have been working on for far too long, the manuscript that is going to get finished on this sabbatical if it kills me. It was daunting. It had been a while since I sat with it, but I went back to a trick that helped me get my dissertation done when I was in grad school–I set the timer. 20 minute sessions in which the only thing to focus on is the document itself. Have to look up a reference? Too bad! Wait until the timer goes off. As anyone who has used this technique knows, by the time those 20 minutes are up you are in to the task of writing. You have found a groove and want to keep going. Get up from the chair, stretch, get some more tea and set the timer for another 20 minutes. I did this a few times yesterday and it felt good. I also gave myself permission to sit and think. Towards the end of the day I shut off the computer, grabbed a book and sat in my reading chair to read. I didn’t take notes. I simply read. The panic started to subside. It isn’t gone completely, but this seems to be a much better approach.